Home Health Conscious Disagreement — How to Disagree without Fighting! 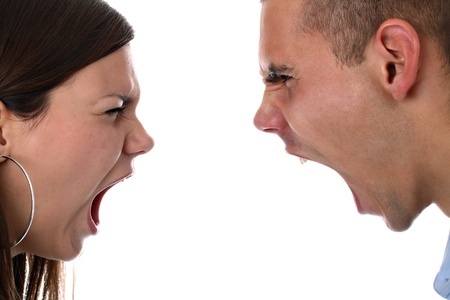 Conscious Disagreement — How to Disagree without Fighting! Join me on the road less traveled & discover all that we have in common. 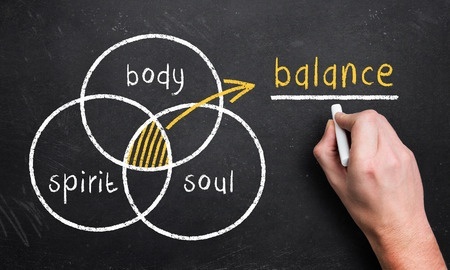 I believe that is what we actually are when we aren’t inhibited by unnatural diets, beliefs and lifestyles. Over time a raw food lifestyle will help you experience that for yourself. It’s always simpler to disagree than to find what we have in common. But what we have in common is what we are really looking for. And that can come naturally from a healthy, empowered, whole being nurtured with raw, live and whole food. While a conscious disagreement is much more likely to produce a satisfying outcome for both parties, it’s far from easy. Dropping our defensive armor may feel foolish or even dangerous. But being more open and vulnerable is far more likely to elicit a conscious response than being defensive. Today, social networking, chat rooms and other online services has turned our writing into a virtual “conversation.” Just a few short years ago writers “wrote” and readers “read.” The Internet lets readers respond, make comments, reply to forums, share on Facebook and create their own blogs. And they do! So today there even lot more disagreeing than ever before! That doesn’t always mean people are getting angrier. It’s just that he structural change in the way we communicate now is driving an increase in disagreement.There’s a danger that this will make people even angrier — particularly online where it’s easier to say things you’d never say in person. So, if we’re all disagreeing more we should be more careful to do it well. I call that “healthy disagreement” — but what does that even mean? 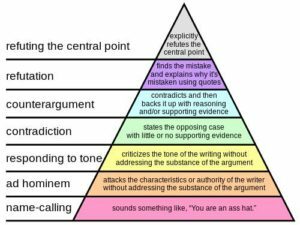 Ad Hominem – an ad hominem attack is not as weak as name-calling. It might actually carry some weight. For example, if a senator wrote an article saying senators’ salaries should be increased, one could respond, “Of course he would say that. He’s a senator.” This wouldn’t refute the argument but it may at least be relevant to the case. However, it’s still a weak form of disagreement. If there’s something wrong with the senator’s argument you should say so, and if not then what difference does it make that he’s a senator? Saying an author lacks the authority to write about a topic is just another form of an ad hominem—and is a particularly useless one, because good ideas often come from outsiders. The question is whether the author is right or not. Responding to Tone – now we’ll see responses to the writing rather than the writer. The lowest form of these is to disagree with the author’s tone, for example, “I can’t believe the author dismisses intelligent design in such a cavalier fashion.” Though better than attacking the author, this is still a weak form of disagreement. It more important if the author is right or wrong or right than what his tone is. So if the worst thing you do is criticize the tone, you’re really not saying much. Contradiction – Here we finally get a clear responses to what was said, rather than how or who. The lowest form of response to an argument is simply to state the opposite with no evidence. “I can’t believe the author dismisses intelligent design in such a cavalier fashion. Intelligent design is a legitimate scientific theory.” Sometimes just seeing the opposite stated clearly is enough to see that it’s right, though some evidence does actually help. Counter-argument – Now we reach the first form of a convincing disagreement: counterargument. Arguments up to here can easily be ignored because they don’t prove anything. But a good counter-argument can prove something. When directed at the original argument, it can be convincing, but more often than not the people are actually arguing about two totally different things — or even agree with each other but don’t realize it. 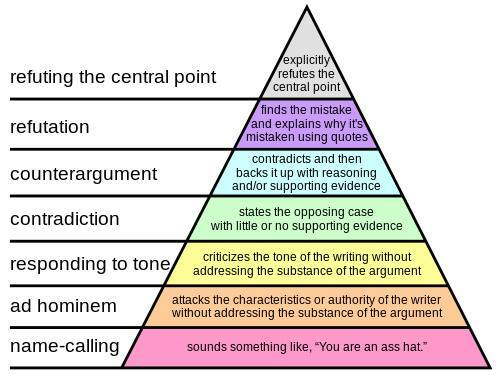 Refutation – The most convincing type of disagreement is refutation. It’s also the rarest form because it’s the hardest. To actually refute someone’s argument you probably have to quote them, you have to find the part of their argument you disagree with and explain why they’re mistaken. While refutation uses quoting, quoting an arguments doesn’t necessarily mean you’re refuting it. Refuting the Central Point – The power of a refutation depends on what you are refuting — hopefully, the central point of an argument. Truly refuting something means you have to commit to exactly what the central point is. The biggest advantage of understanding the different types of disagreements is that it helps us to see through intellectually dishonest arguments. 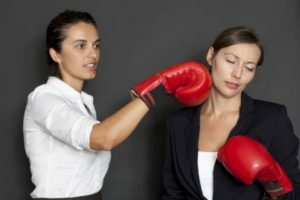 An eloquent speaker or author can give the impression of winning an argument by using forceful words when in fact they may not have actually won the argument at all. However, most intellectual dishonesty is not intentional. The people making the argument with may really believe they’re really saying something. But the biggest benefit of disagreeing well is not it makes for better conversations but that it makes the people who have them much happier. Moving up the disagreement hierarchy makes people less mean so it can make more of them happier. People don’t really like being mean — they usually do it because they can’t help it. Some of the concepts used here courtesy of Paul Graham, the famous author of Lisp that Business Week included in the 2008 edition of The 25 Most Influential People on the Web.